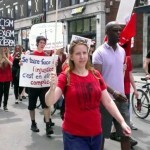 I did indeed go to the Second Annual Montreal March to Close Down All Slaughterhouses. It was, as last year, a glorious sun filled day in our beautiful city (la belle ville). I had arranged to meet some friends there, friends with whom I have marched in the past, vegans who share my belief that we can have a vegan world. 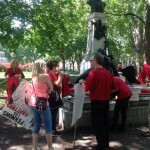 There were flags, banners and posters made ready by KARA, who organized the day’s events. We lined up eagerly for our symbol of choice and chatted for the half hour leading up to the march. By all accounts, the crowd was larger than last year. It was certainly just as enthusiastic and even musical. 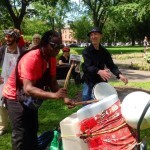 There was a trio playing three types of drums, one of which was attached to a dolly of sorts. 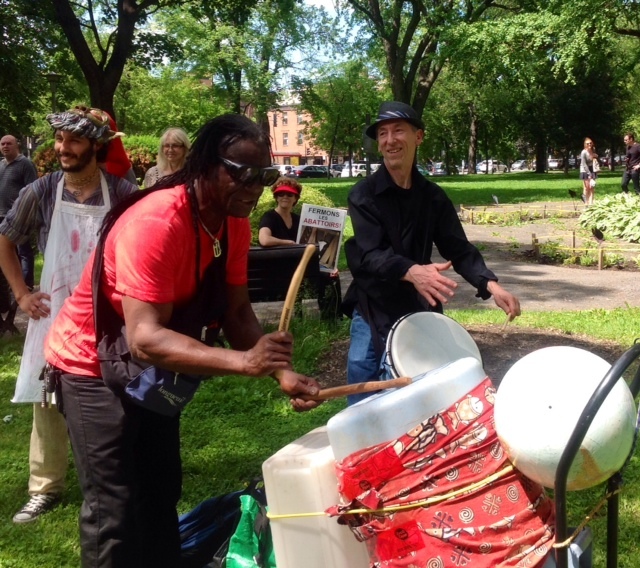 They drummed before, during and after the march and added much to the almost joyous atmosphere. After all, we have much to celebrate despite knowing what we know about the incredible, pointless suffering of species misused and abused for human consumption. We celebrate our solidarity, we celebrate the opportunity to inform, to educate and to be a constant presence. We are, I daresay, a pebble in the shoe of non veganism, of carnism. I was most struck by what I will call people experiences. Allow me to share them with you, my dear readers. Me: How long have you been vegan? D: Yes, I was vegetarian before, but when I learned about the cruelty in the dairy and egg industries, I became vegan. I don’t even miss meat! I was so impressed by this young man as he stands by his convictions, which may be tough for someone his age (peer pressure and all). He is continuing to educate himself about what it means to be vegan. He had lots of questions for me and of course, I shared what I know, not claiming to be an expert in all things vegan. So D, if you are reading this post, kudos to you and carry on, my friend, You are the present and the future of veganism, of kindness and compassion and of justice. 2) Hare Krishna Member ( I’m sorry, I did not get his name), D, my friend Lily and myself. HK: The cow is the mother of us all and therefore her milk is the purest of all milks and wonderful for humans to drink. L: There is more cruelty in a glass of milk than in a steak that comes from an animal killed in a slaughterhouse. HK: In India the cows can keep their calves and out of thankfulness give their extra milk to their caretakers. If they aren’t milked they will get sick. They are well taken care of. Me: Cows are mammals, as are humans. Cows and humans and all other mammals produce only the milk that is needed for their babies. They do not produce extra for anyone else for any reason. HK: I don’t believe that. Cow’s milk is pure and good for humans and it is only industrial produced milk that is poison. D: Well, if you know that mass produced milk is poison and the cruelty in this industry is well documented, why don’t you stop drinking milk? The conversation continued for a bit, but I soon realized that this well intentioned, but misguided gentlemen was not in a place to hear the facts. So, I suggested, kindly of course, that he read Dr. Will Tuttle’s book, “The World Peace Diet”, thanked him for the conversation and moved on. Nothing more to be gained there at that given moment. I just hope that we planted a seed that grows in the mind and heart of this young man, hopefully sooner than later. Sometimes I feel so alone in my veganism. The videos of cruelty are so hard to see. I can be upset for weeks. I love my cats, but it is hard to feed them food made from animal by products. I am afraid not to, though. I feel as you do, my good friend M. I have been unfriended on Facebook and probably blocked, teased by good friends and personally challenged by my reticence to speak up despite all that is at stake. But we carry on and are not deterred. That is what we do. The world needs to stop eating meat. I will have a conversation with people who eat meat, but I do not agree with or support their choice to do so. 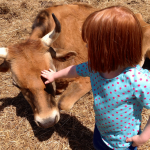 My friend J and his lovely wife M are working to introduce the world to veganic farming. 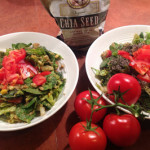 I applaud and support their active bid to mainstream whole food, plant based eating. 5) And Lily, what can I say about my friend Lily? Her enthusiasm is infectious, her knowledge encouraging and her commitment inspiring. I hope to collaborate with her in the near future. 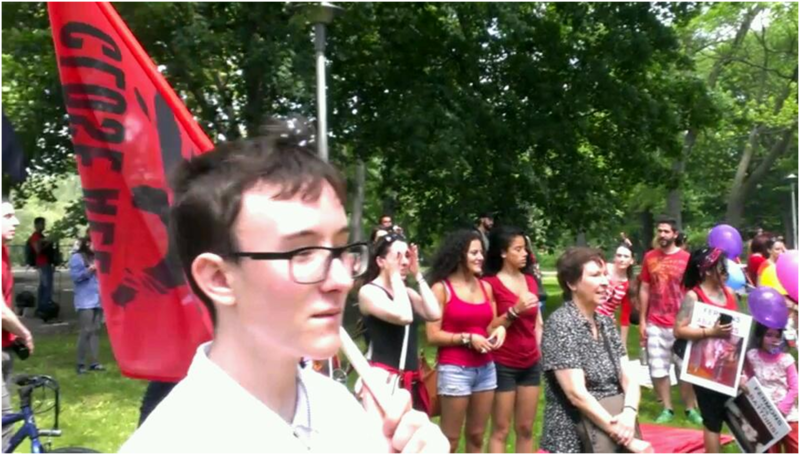 6) One of my readers marched with us in solidarity in Berlin, Germany. Here is what my vegan friend Krissa said. I am with you, my friend, I am with you. Thank you so much for this info!!! I didn’t know about this, but Berlin is on the list and I’ll be there. The last demo/march I went to was in April against animal testing. Thank you again for posting this! I would have been so sad to miss it. With you in spirit on Saturday. Don’t be afraid to stand up and speak your truth. Research the facts and present them in a kind and compassionate, but firm way. Attend peaceful marches with like minded people who can, through conversation, help to further define and affirm your advocacy. Beautifully written my awesome friend. I’m looking forward to our collaboration in the near future. Being a voice for the tortured victims is no longer a choice for me and I can’t and won’t stay silent. Awakened to the unimaginable insane cruel exploitation and commodification of our sentient nonhuman friends is extremely heavy on the heart & conscience to say the least. As you are very well aware of, if people knew what was really going on behind the walls of these slaughterhouses and the misleading bogus info about human health benefits, as well as the huge role animal agriculture has on the destruction of our planet, they wouldn’t see their meat, dairy, eggs, leather etc., the same way ever again. The misinformation is so immense and done with such force that we all (the awakened) need to do our part in edifying and getting videos to go viral ‘something I’m working on’ and creating an incredible snowball effect, like a crazy powerful freight train gathering such momentum and force that nothing can stop it! – no amount of detrimental propaganda or money from greedy evil doers can slow it down, not even with confusion tactics =) cause there is NO confusion when seeing and hearing their haunting cries for help when the blinders come off and the conditioning falls away. Let’s make sure we get the pebbles in their shoes to become jagged rocks!! For ALL the Animals & Planet. About the picture thing. I had a lot of issues transferring pictures to this post-long boring story. The one of the picnic which I put on the home page had me in it, but was cut off in the transfer. I have fixed this up. Oh, yay!!! 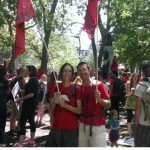 So great to read about your day at the demo/march! I just sent you a couple photos anyway, but they aren’t as clear as the ones you posted so it’s just for you to get to see me there. 🙂 And again thank you more than I can say for posting about the day. I do searches online to see if there are marches in Berlin and you’d be surprised how many I find out about after the fact. They get almost (scratch that “almost”) no publicity here. 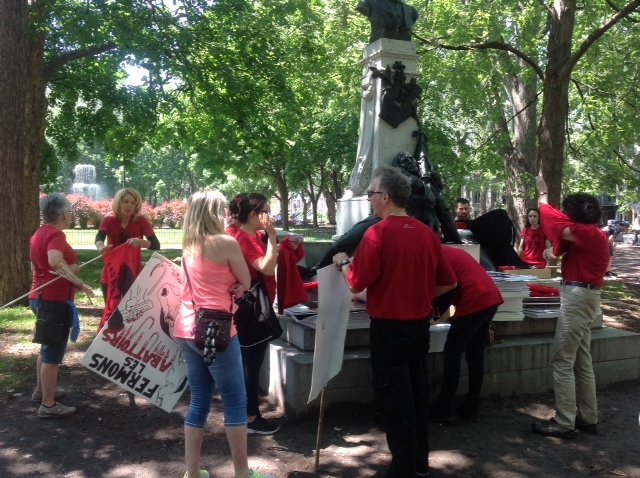 The one against animal research that happens every April around the time of the day to recognize lab animals gets publicity and I put up posters and fliers for that one. 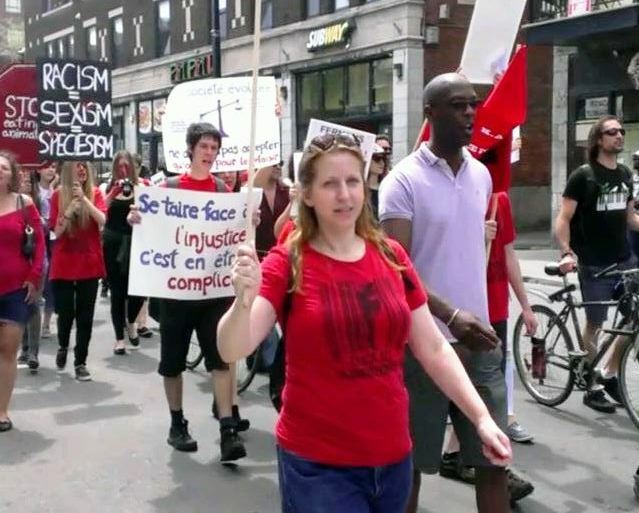 Anyway, so neat to read about your experiences at the Montreal demonstration. Being from the US and having visited Canada, I have a good idea of the attitude toward “veganism” there and it’s just as bad as here although a bit different. And yes, good for that young man for thinking for himself and believing in what’s right at such a young age – because if things are still the same there as when I knew them, he came by that on his own. He didn’t learn it at home or from peers. Thanks for sharing about him because every story about us humans becoming compassionate and living correctly is inspiring. Your friend M. said exactly what I feel about feeding my cat, but there you have it. We have no choice. And thanks to human meddling in non-human affairs, there’s no choice. I’d be very sad to see “my” cat were he able to live a natural life kill his “food”, but that is done without human meddling and they have no choice. We human beings have a choice. And it is sickening what our species has chosen to do that has gotten us and the rest of our fellow beings into the boat we’re all in now. But, there is hope and I don’t want to end this on what sounds like a negative note. So thank you again for sharing first of all the info and also for your experience there. Here in Berlin, when I go to the anti-research demo, there are no hecklers. There was one time (and I may have written about this) that a (had to re-write this) “lady” driving a horse carriage started in at us and I am ashamed to say, but I let her have it worse than anyone else marching with us. The horses being forced to pull those carriages make me upset too and the two she had were two of the SAME ones I had pet and stood with one year before when our march started at the Brandenburg Gate. To see them again in that life and her heckling…I didn’t handle it as I should have. This year, when we got heckled – not a lot, but enough to notice – “but it tastes so good” and much worse that I won’t print, I kept my dignity and head held high and I didn’t even give dirty looks. But I did give a “look”. And I noticed that more than a couple times, that shut them up. Well this sure turned into a long comment! I’m so glad you were able to post about your experience there. And I did read your fathers day post and I’m sorry for what your experience of a father was. My father certainly isn’t vegan and we have not seen eye to eye many times, but he always did make me feel that he loves me and for that I am clearly lucky and blessed because it doesn’t always happen that way and especially not when you don’t see eye to eye on some important things. Beautiful reply and thank you for sharing your thoughts, emotions and for your solidarity for the beings who are suffering as we speak. I have to and do believe that what we do makes a difference. Thank you for the compassion about my father. I use his life only as a stepping stone- a wayto help people understand that cruelty is never good. Let us all be kind! I found the HK conversation the most interesting. Whatever happens in India, cows are not treated like that here, no dairy cow gets to keep her calf and ‘share’ her milk with us, it’s a totally commercial enterprise that ruthlessly exploits the animals and supplies the veal industry. A follower of HK in the West will be funding slaughter and cruelty by drinking milk, ingesting nothing pure except pure cruelty. I think the point this young gentleman was missing is that exploiting non human animals at all for our wants, not needs is the issue. It does not matter if the cows are well treated, they still die at the end of it. Thinking they are here to serve us is exploitation. As regards the abject cruelty in all of these death for profit industries, the moment we believe that it is okay to use other beings for our own personal gain, we open the door to all manner of cruelty. I felt very strongly that this young man’s heart was in the right place, but that he was operating on information taught to him by his sect. As Lily said to him, please do some research about the facts and then make an informed decision based on those facts. Indoctrination comes in all forms. As parents we indoctrinate our own children with our beliefs, our traditions, our behaviors, our way of facing and interpreting the world. Some of what we teach our children is misguided. One of the best gifts we can give them is the gift of critical thinking, as well as the ability to be open to change, to question what they learned as children, to keep the good and throw out the bad. If we do this then they are able to look at the indoctrination of these cruel, profit driven industries, take a step back and say wow, what is actually being said here and why? 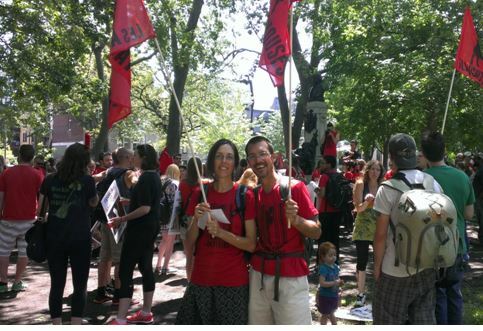 Hi Anne, so glad both you and Krissa got to march! It sounds like it was a wonderful experience. 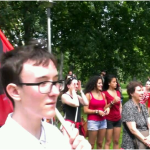 The closest march here was in Toronto, thus too far for me to attend. I thought the conversation with HK interesting too, and frustrating as well. Unfortunately, people often believe what they WANT to believe, until they want (or are ready) to believe something else. So wise on your part to recommend and move on. Yes, the march was illuminating and tiring at the same time. As I mentioned in my reply to Carol’s comment, indoctrination runs deep in our society. It allows us to live without questioning, without thinking for ourselves and ultimately without choosing a different way. I just had an interesting conversation with a very dear friend who said that we need to respect other people’s values. I said to her that I agree with this in principle as long as no one is being harmed for those values. She asked me what I would do if a mosquito was biting me then. I said this is not the same thing at all. We have a right to protect ourselves from harm, but we do not have a right to harm others just because we can, just because our parents taught us about the traditions of our meat eating culture, just because death for profit industries say animal products are good for us. We are deliberately breeding, enslaving, abusing, stealing from and murdering beings to the tune of 65 billion a year. As for the matter of respect, I have said and still believe that “Clarity, not condemnation paves the way to a vegan world”. I respect people enough not to verbally abuse them even if I do not agree with or accept their stance. I think there is another why to convince, to change hearts and minds. But I do want people to be vegan and I will tell them that. There is too much at stake not to be. I try to remain hopeful. What else is there? Hope keeps me doing what I do, keeps me being a presence, a pebble in the shoe of non veganism. It helps me to continue researching and honing my own understanding of what it means to be vegan. It helps me be a little braver when speaking to people about the facts behind our profit driven herding and meat eating culture. It helps me stay in touch with draw inspiration from my fellow vegan advocates, of which you are one. One thing I know for sure is that whether we are pessimistic or optimistic, we will carry on speaking the truth.